Tractor-trailer crash jams traffic on Blue Route (I-476) at I-76 in Montgomery Co.
WEST CONSHOHOCKEN, Pa. (WPVI) -- A crash involving a tractor-trailer is jamming traffic on the southbound Blue Route (I-476) in West Conshohocken. The collision happened at 9:30 a.m. Tuesday. 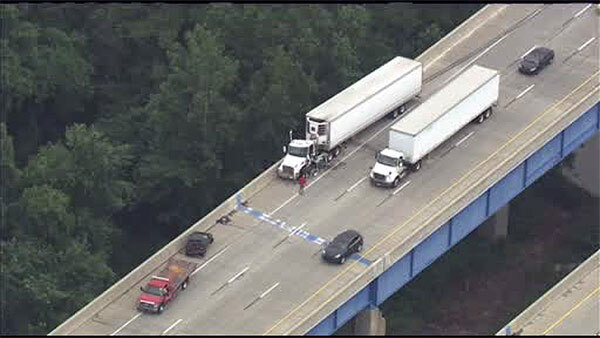 Action News is told a tractor-trailer collided with another vehicle. At least one person was hurt. The extent of injuries to that person was not clear. Traffic on I-476 South was said to be at a virtual standstill, with two right lanes blocked between the exits for Norristown and I-76. Lane restrictions were still in effect more than an hour after the crash.